The Rodgers Cryptogram Puzzle Book Volume 1 contains a collection of 200 motivational and inspirational quotations from famous people that have been encrypted using simple letter substitution ciphers. Each quotation uses a different cipher where each letter of the alphabet has been substituted for another letter. Your job is to decrypt the sentence into its original form. A hint is provided for each quotation later on in the book and finally full solutions are provided together with the name of the author of each quotation. 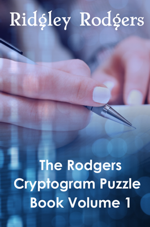 Instructions are included for those who have never tried to solve a cryptogram puzzle before.